Discover how to install an exhaust system in 7 steps. Ever set off a car alarm just by rolling past with a boisterous, ready-to-rumble exhaust system? Finding a quieter, smoother aftermarket exhaust system, without cutting down on performance, is a walk in the park with AutoAnything.com, but this article is designed to clue you in on how to get that new-and-improved system installed. Don't know how to install an exhaust system? It's a lot more straightforward than it might sound. Think about it: your vehicle already has an exhaust system mounted on it, so all you're really doing is taking off the old and swapping it with the new, make sure the exhaust tips are mounted straight and you're good to go. Now, if you had to start from scratch and design an exhaust from some un-bent lengths of pipe, the exhaust systems installation process would be mighty tricky. 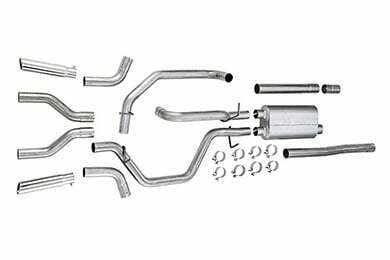 But, all of the major exhaust makers out there, from Flowmaster to Magnaflow, create custom-sculpted systems that directly replace your factory exhaust. First, you need room to work. If you have a lift, lift your vehicle. No lift? No problem. You'll need to jack your vehicle up and secure it with heavy-duty jack stands. Never work under your vehicle unless it is safely supported! Next, you need to disconnect your old exhaust starting at the catalytic converter. There should be a clamp securing it to the catalytic converter which can be undone. If not, you may have to cut the pipe right past the converter. Working your way back from the converter, unhook the exhaust from its hanging brackets and pull it out. Assemble your new Borla exhaust or Gibson exhaust, but don't tighten the clamps too snugly—you'll likely need to make some minor adjustments while you're slipping it into place. Work your new performance exhaust into place and line it up with the stock hanging brackets. Exhausts made from respected companies, like Banks Exhaust and Bassani Exhaust, will connect directly to the stock brackets. Once the entire exhaust is in place, tighten all the clamps. Lower the vehicle and start the motor to check for leaks. So long as you don't have any exhaust leaks, then you're all finished. Since your exhaust heats to high temperatures and rattles around quite a bit, you'll want to re-tighten all the clamps after about two weeks. See—pretty easy. Now, there are some slight variations to these basic instructions – a Dodge Ram exhaust is naturally going to take different steps than a Nissan Titan exhaust – but these broad brush strokes paint the basic picture. So, the question you have to ask yourself now is whether the effort it takes to install an exhaust is worth the performance payoff? Although the horsepower and torque ratings vary for different vehicles, you will experience an immediate boost in thrust once your new exhaust is in place. And, if you can control your lead foot, you could even see a (modest) spike in your MPGs. Plus, if you really want a high-flow exhaust but really aren't mechanically inclined, any muffler shop in your neighborhood should have no trouble bolting your new exhaust into place. We also have tons of exhaust reviews on our site, be sure to give them a read! 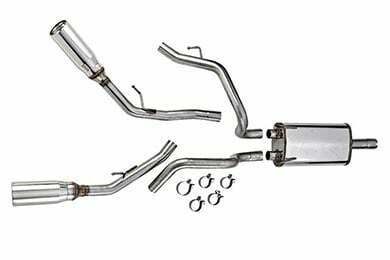 2012 3.6 legacy subaru exhaust ? This is a very simple upgade at a great price point. The exhaust sounds great while not being overwhelming. I would recommend it to any enthusiast. The car drives smoother, sounds good and looks good. I recommend this product. Good quality and good price. Love the 4-inch tips. Reference # 755-437-924 © 2000-2019 AutoAnything, Inc.